This Tuesday, I am teaching a 2nd grade lesson for a teacher who will be out that day. I offered to this for all of the teachers if my schedule permitted. I thought it was a great way for me to learn more about each grade level, possibly plan and teach it with other grade level teachers for that lesson, and it saves having to use a “sub plan” lesson which we all know either leaves us with more papers to grade or even worse, having to redo when we return. After doing this same type of thing for a 3rd grade classroom last week, and getting great suggestions in the comments after the lesson, I thought this time I would try throwing it out there before I taught it. I would love to see how this lesson could take shape with the input ahead of time! Lately, I have seen a lot of tweets regarding using the 5 Practices when planning. Now, while I don’t use them to the extent the book lays out for every lesson (because, you know, time), I do always have them playing in the back of my mind when I plan. So, I am going to plan here, one piece at a time, using the 5 Practices. I will pose my questions where I have stopped and look forward to feedback in the comments! The lesson I am planning is structured as a workshop in which one piece calls for the students to individually solve the following pages, however I am thinking I want to turn these two pages into the lesson because I think they could lead to some amazing thinking! [Planning 1]Students use equal groups when thinking about a context. I am not sure if this is too broad, but there is so much here. What I would really love to see is students moving beyond drawing each one out and counting by 1’s but I am also so interested to see how multiplication and division show their beginnings here! [Final Plan] After a conversation with a colleague, my goal for the lesson is for students to begin unitizing the equal groups when combining the groups. I also have this subgoal of proportional reasoning when thinking about people/eyes or dogs/legs. [1st Planning Thought] Before moving on here, I need to decide whether to focus on both pages or just focus my planning on one or two problems. 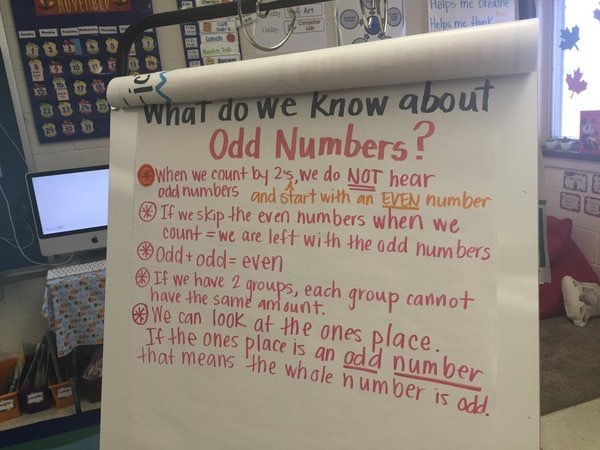 Although they all involve equal groups, I am wondering if focusing on a particular one brings out more conversations and connections between the ways in which we can count? I am leaning to #4, but I it would be helpful for me to also see how they think about 1-3 before thinking about the share of #4. OR, do I leave 4 for the next day after gathering info and sharing strategies together for 1-3? 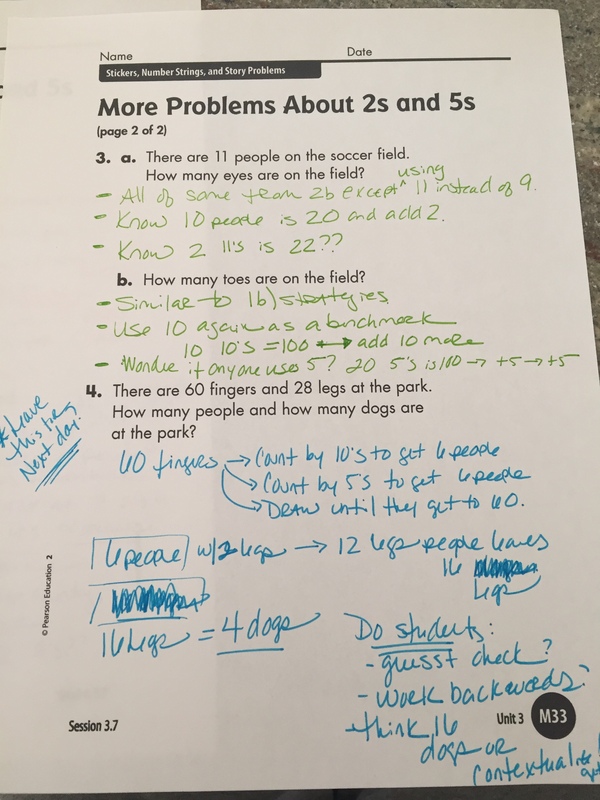 [2nd/Final Planning] I am thinking now that I am going to launch with a simple sentence of “There are 12 people” and ask student what problems we could solve based on that sentence. Talk about ears, eyes, fingers, legs…etc and then how we could represent our work. I am thinking to not actually DO the math but write the ways as a reference back at their seats. For example, “Draw pictures, Use numbers, Use cubes, Write equations, Use words, Use tables…etc” In planning with another 2nd grade teacher today, we saw that “show your work” at the top pushed some students back to pictures when they were not necessary. After this, I am going to have 1/2 of the class working (in groups) on problem 1 and the other half on 2. Before they jump right into group work, however, I will ask them to take individual think time to get into the problem. After the groups have arrived at an answer, I will have a couple students swap seats and explain to the new table how they arrived at their answer. They will then discuss what was the same and different about their problems and ways they solved their problems. After they share among tables, I will bring them to the carpet for a group discussion about these similarities and differences. During the work at their seats, I will be walking around, and asking questions when necessary to generate conversation (I don’t know this class as well as I would my own so I do not know what to expect as far as conversation) and looking at strategies. Questions: How did you arrive at your answer? Does everyone at the table agree ? Where do you see [the ears, people, eyes, fingers] in your work? Is there an equation to match your work? Again, after discussing this with a colleague, I will not only be monitoring student understandings but also monitoring for which students to switch and share. I would not want students with the same strategies to switch and not have anything to build upon so this is a great opportunity to structure a better situation for conversation. I will choose papers based on a variety of strategies that build along a trajectory. I would like to see students who drew out the problem by 1’s, 2’s, 4, 5’s or 10’s, then others who used one group to represent the 2’s,4’s, 5’s, or 10’s (unitizing), then students who used equations or number operations w/o the pictures. In the share, after each group has presented to the other groups, we will come to the carpet for a share. The sharing will be sequenced in the way I discussed in the Selecting part, asking students during each student work sample how it is similar and different than the ones we previously shared. The connecting I see happening through my questioning as we share strategies. I am still working on writing this part out and looking for the connections that can be made, aside from the picture to number representation connections. The connections I would love to see students making throughout the work and sharing, is how we can combine equal groups. For example I would like the student who is drawing ones and counting them all to move to seeing those ones grouped as a 2 or a 5 depending on the context. I would love the student who is seeing the five 1’s as one group of 5 to now see that if they have 2 of them it will make a 10 and if we have 4 of them we would have 20 and really start looking at different ways to combine those groups. For the journal, I will give them the scenario that there are people and dogs in the park and 28 legs, how many of each could there be? This will offer multiple solutions (Thanks Simon) and allow for them to see some great patterns the following day! I will let you know how it goes! 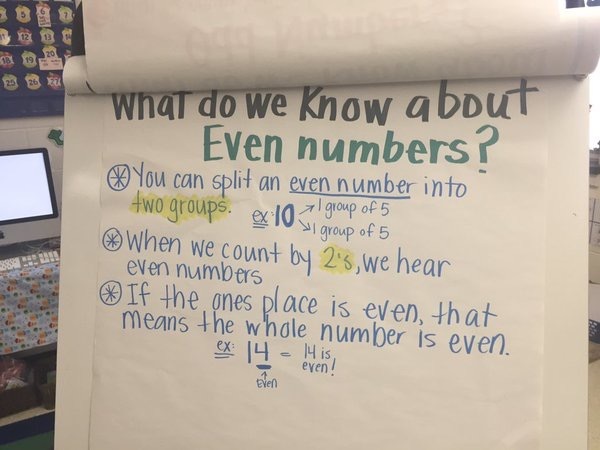 This entry was posted in 2nd grade, Equal Groups and tagged 2nd Grade, equal groups on November 15, 2015 by mathmindsblog. I would probably leave #4 until the next day. See what they can do with the first 3. Maybe kids who finish those early can write similar problems about eyes and fingers and legs. Then really dig into #4 the next day. That is what I thought too. Now, how would you structure the work. I dont have to follow those pages exactly… So would you give one for whole class to solve in groups? Then gallery walk to see others? Or do all as tables and then share together on one in particular? I think option 2. Let them get to work on the first 3 problems. Then when all groups are done with #1 (or #2 would even be better) you could do a mid-workshop interruption and share out with a gallery walk or look at samples under a document camera and discuss the various solutions. Groups can then go back and re-work or revise their work if they want and continue on. I like Joe’s ideas above. I’m wondering if you could give different problems from 1-3 to groups as sort of a launch to the lesson. Then maybe a gallery walk or some sort of switching, then have kids sit down at other desks and make sense of the work and have small group discussions. I do “around the world” where students switch seats with anyone in a different group. They are given time to make sense of another student’s work, then they have to explain the work to the students they’re sitting with. When I say, “Boomerang,” they all go back to their seats. Then, students could have time to edit/revise their work after. You could collect these work samples or take pictures of them and use them to begin the following day’s lesson. Then you could use #4 as the heart of the next day’s lesson and you can go through the whole 5 practices. Looks like fun! 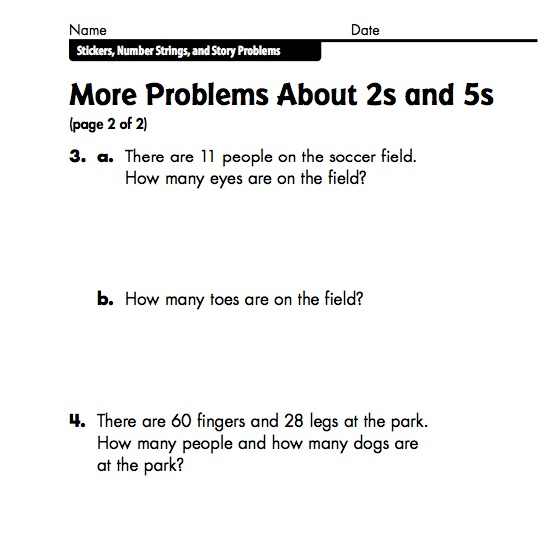 It seems like problems 2 and 3 would be better problems to begin with and maybe easier for students to picture what is happening and connect to the groupings better. Problem 1 leads to them thinking how many groups of 2 in 34. Then that builds into them correctly solving the second part. Problems 2 and 3 maybe lay out the foundation more clearly. Just a thought. I think problems 2 and 3 would be a good place to begin. They seem to paint a better picture of groupings to begin with. Problem 1 is asking how many groups of 2 in 34? This is not as clear as what problems 2 and 3 are asking. Building off of their ideas you could then go back to problem 1 and tackle problem 4 on another day. It’s interesting to all try and contribute to the planning for this Kristin! I’m just back from my school day, so now I’ve got a moment! I wonder whether it’s possible to ask for some kind of physical or pictorial model? This would maybe slow things down to let everyone really digest the situation, and give practice at turning to this as a tool. And see what they made of it without me, whether they could represent a possibility or several. With sharing ways and documenting this in their journals, I imagine that would be a whole lesson. Obviously I’m at a distance from how you teach, so I can quite well imagine I haven’t quite tuned in to the students or the curriculum, or the teacher for that matter! Let us know what you do, and how it goes!